There is a good reason that Hizbullah chief Hassan Nasrallah has accepted UN Security Council Resolution 1701, which sets the terms for a cease-fire between his jihad army and the State of Israel. While the resolution was not passed under Chapter 7 of the UN Charter and so does not have the authority of law, in practice it makes it all but impossible for Israel to defend itself against Hizbullah aggression without being exposed to international condemnation on an unprecedented scale. This is the case first of all because the resolution places responsibility for determining compliance in the hands of UN Secretary-General Kofi Annan. Annan has distinguished himself as a man capable only of condemning Israel for its acts of self-defense while ignoring the fact that in attacking Israel, its enemies are guilty of war crimes. By empowering Annan to evaluate compliance, the resolution all but ensures that Hizbullah will not be forced to disarm and that Israel will be forced to give up the right to defend itself. The resolution makes absolutely no mention of either Syria or Iran, without whose support Hizbullah could neither exist nor wage an illegal war against Israel. In so ignoring Hizbullah's sponsors, it ignores the regional aspect of the current war and sends the message to these two states that they may continue to equip terrorist armies in Lebanon, the Palestinian Authority and Iraq with the latest weaponry without paying a price for their aggression. The resolution presents Hizbullah with a clear diplomatic victory by placing their erroneous claim of Lebanese sovereignty over the Shaba Farms, or Mount Dov – a vast area on the Golan Heights that separates the Syrian Golan from the Upper Galilee and is disputed between Israel and Syria – on the negotiating table. In doing so, the resolution rewards Hizbullah's aggression by giving international legitimacy to its demand for territorial aggrandizement via acts of aggression, in contravention of the laws of nations. Moreover, by allowing Lebanon to make territorial claims on Israel despite the fact that in 2000 the UN determined that Israel had withdrawn to the international border, the resolution sets a catastrophic precedent for the future. 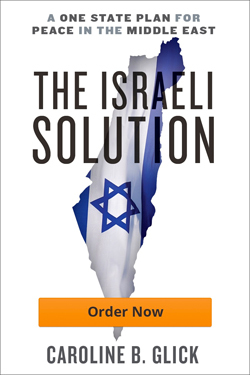 Because Lebanon is receiving international support for legally unsupportable territorial demands on Israel, in the future, the Palestinians, Syrians and indeed the Jordanians and Egyptians will feel empowered to employ aggression to gain territorial concessions from the Jewish state even if they previously signed treaties of peace with Israel. The message of the resolution's stand on Shaba Farms is that Israel can never expect for the world to recognize any of its borders as final. By calling in the same paragraph for the "immediate cessation by Hizbullah of all attacks and the immediate cessation by Israel of all offensive military operations," the resolution treats as equivalent Hizbullah's illegal aggression against Israel and Israel's legitimate military actions taken in defense of its sovereign territory. Operational Paragraph 7, which "affirms that all parties are responsible for ensuring that no action is taken contrary to paragraph 1 [which calls for a cessation of hostilities] that might adversely affect the search for a long-term solution, humanitarian access to civilian populations, including safe passage for humanitarian convoys, or the voluntary and safe return of displaced persons," all but bars Israel from taking military action to defend itself in the future. Any steps Israel takes will open it to accusations – by Annan – of breaching this paragraph. Foreign Minister Tzipi Livni had let it be known that Israel's conditions for a cease-fire included the institution of an arms embargo against Hizbullah. The government also insisted that the international force it wished to have deployed along the border would work to dismantle Hizbullah. However, paragraph 8 puts both the question of an arms embargo and Hizbullah's dismantlement off to some future date when Israel and Lebanon agree to the terms of a "permanent cease-fire." In addition, it places the power to oversee an arms embargo against Hizbullah in the hands of the Lebanese government, of which Hizbullah is a member. While the resolution bars Israel from taking measures necessary to defend its territory and citizens, by keeping UNIFIL in Lebanon it ensures that no other force will be empowered to take these necessary actions. Furthermore, paragraph 2 "calls upon the government of Israel, as that deployment [of the Lebanese military and UNIFIL] begins, to withdraw all of its forces from southern Lebanon in parallel." This means that Israel is expected to withdraw before a full deployment of Lebanese and UNIFIL forces is carried out. As a result, a vacuum will be created that will allow Hizbullah to reinforce its positions in south Lebanon. Finally, the resolution makes no operative call for the release of IDF soldiers Ehud Goldwasser and Eldad Regev now being held hostage by Hizbullah. By relegating their fate to a paragraph in the preamble, which then immediately turns to Hizbullah's demand for the release of Lebanese terrorists held in Israeli jails, the resolution all but eliminates any possibility of their returning home. It grants the Lebanese government and military unwarranted legitimacy. The resolution treats the Lebanese government and military as credible bodies. However, the Lebanese government is currently under the de facto control of Hizbullah and Syria. Moreover, the Lebanese army is paying pensions to the families of Hizbullah fighters killed in battle, and its forces have actively assisted Hizbullah in attacking Israel and Israeli military targets. Indeed, the seven-point declaration issued by the Lebanese government, which the UN resolution applauds, was dictated by Hizbullah, as admitted by Lebanese Prime Minister Fuad Saniora and Nasrallah last week. It incites Shi'ite violence in Iraq. From a US perspective, the resolution drastically increases the threat of a radical Shi'ite revolt in Iraq. Hizbullah is intimately tied to Iraqi Shi'ite terrorist Muqtada al-Sadr. In April 2003, Hizbullah opened offices in southern Iraq and was instrumental in training the Mahdi Army, which Sadr leads. During a demonstration in Baghdad last week, Sadr's followers demanded that he consider them an extension of Hizbullah, and expressed a genuine desire to participate in Hizbullah's war against the US and Israel. It should be assumed that Hizbullah's presumptive victory in its war against Israel will act as a catalyst for violence by Sadr and his followers against the Iraqi government and coalition forces in the weeks to come. Indeed, the Hizbullah victory will severely weaken moderate Shi'ites in the Maliki government and among the followers of Grand Ayatollah Ali al-Sistani. It empowers Iran. Iran emerges as the main victor in the current war. Not only was it not condemned for its sponsorship of Hizbullah, it is being rewarded for that sponsorship because it is clear to all parties that Iran was the engine behind this war, and that its side has won. he UN resolution does not strengthen the US hand in future Security Council deliberations regarding Iran's illicit nuclear weapons program because the states that object to any action against Iran – Russia and China – will continue with their refusal to sign on to any substantive action. Indeed, Russia's behavior regarding the situation in Lebanon, including the fact that a large percentage of Hizbullah's arsenal of advanced anti-tank missiles was sold by Russia to Syria and Iran, exposes that Moscow's role in the current conflict has been similar to the position taken by the Soviet Union in earlier Middle East wars. Furthermore, because the resolution strengthens the UN as the arbiter of peace and security in the region, the diplomatic price the US will be forced to pay if it decides to go outside the UN to contend with the Iranian threat has been vastly increased. Many sources in Washington told this writer over the weekend that the US decision to seek a cease-fire was the result of Israel's amateurish bungling of the first three weeks of the war. The Bush administration, they argued, was being blamed for the Olmert government's incompetence and so preferred to cut its losses and sue for a cease-fire. There is no doubt much truth to this assertion. The government's prosecution of this war has been unforgivably inept. At the same time it should be noted that the short-term political gain accrued by the US by forging the cease-fire agreement will come back to haunt the US, Israel and all forces fighting the forces of global jihad in the coming weeks and months. By handing a victory to Hizbullah, the resolution strengthens the belief of millions of supporters of jihad throughout the world that their side is winning and that they should redouble efforts to achieve their objectives of destroying Israel and running the US out of the Middle East.